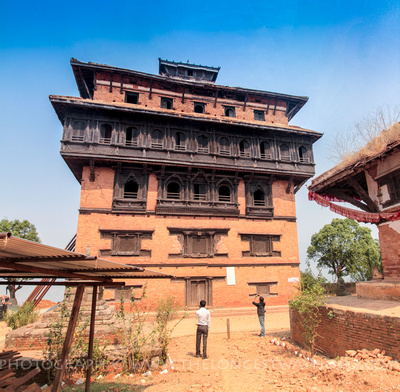 The proud historic fortresses of Nuwakot (meaning nine fortresses - नुवाकोट जिल्ला) still stand despite damage from the 2015 earthquake. Originally built by the Newari to protect the trading routes from Tibet the fortresses are the starting point of Nepal's unification. 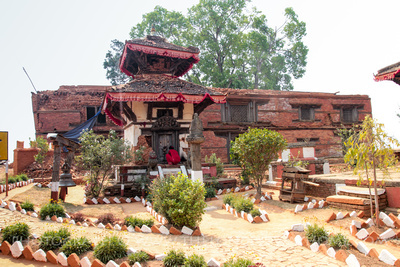 Located outside of the Kathmandu Valley, Nuwakot is only one of a few places in Nepal where you can see Newari buildings. It's very much an "off-the-beaten-track" destination so be prepared for either private transport or a rough journey there. For historians, those seeking an "undiscovered" part of Nepal or for those looking for an adventure Nuwakot won't let you down. 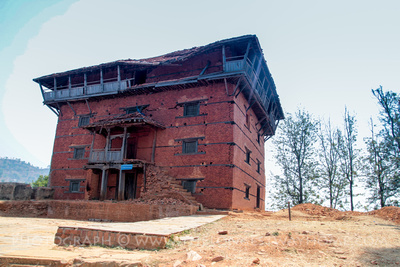 Nuwakot is battered and torn. The old fortress itself is teetering on the edge of mountain ridge. While opposite it the old Malla Durbar Square is crumbling away. Nuwakot stands over the Trisuli river. The surrounding area is famous for its coffee plantations and homestays. Visiting Nuwakot during peak season can give you epic views of Nepal. 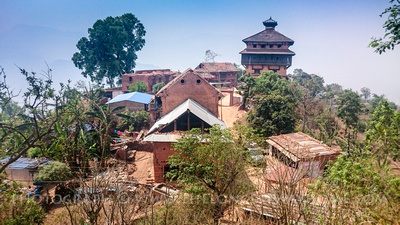 Nuwakot is noted as being a fortress area during the reign of the Mallas in the Kathmandu Valley 1201–1769 CE. This period was when Nepal was still a collection of kingdoms with Kathmandu, Bhaktapur and Patan being controlled by the Mallas. An outsider coming from Gorkha, King Prithvi Narayan Shah (1723-1775), captured the hill station of Nuwakot with the plan that he would use it as a base to conquer the entire Kathmandu Valley by cutting oﬀ the supply line from Tibet. His first attempt failed in 1743. His second attempt succeeded and started a chain reaction of conquests that saw the fall of the Malla era. With Nuwakot under his control the king built massive military towers on the surrounding hills which eﬀectively blocked oﬀ trade into the Kathmandu Valley. The Mallas would not go easily though and it took three attempts for King Prithvi Narayan Shah to conquer Kirtipur alone. Then came the fall of Patan followed by Bhaktapur and finally Kathmandu. King Prithvi Narayan Shah unified the kingdoms into one which was his plan to prevent the British from colonizing Nepal much like it was doing in India. The King died in 1775 at the age of 52 in the fortress palace at Nuwakot before the full administration of Nepal was completed. His sons continued the work which continued on through to modern day Nepal. In 2018 it was discovered that Chinese renovation of the area would be carried out. Unlike in highly populated areas like Kathmandu there are only a few people here who have voiced concern at cheap modern construction methods. Moreover, there are rumors of eco style leisure parks that worry many about the surrounding environment and culture. For now, it's a case of get there before it's gone. 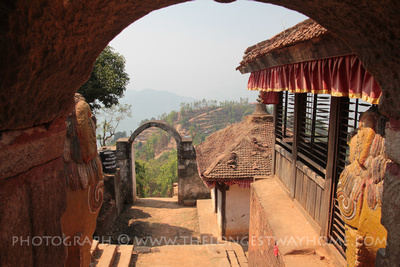 As you make your way along the winding steep road on the hill to Nuwakot the landscape becomes near on medieval. The green valley below is dotted with trees and farmlands all watched over by the foreboding fortress tower you are approaching. Although there are "nine fortresses" there really is only one worth visiting. The all dominating block like structure built in 1762 that seems to be perched onto the top-side of a cliﬀ is the former palace of King Prithvi Narayan Shah. The name Saat Tale Durbar means “The Seven Storied Palace”. It is here that plans were made and set about to conquer the Kathmandu Valley and unified Nepal. The building used to house a museum which opened in 2011 but is now closed. A quick look around the back of the building will show you why. Huge metal poles line the entire rear wall propping the entire building up. Previously the first ﬂoor was a reception for the museum. The second ﬂoor contained a room used for religious purposes. The third ﬂoor contained the living quarters of the king and his two wives. Interestingly the rooms of the wives were designed so that they could only be entered through via the king’s room. You can still note the balcony encircling the entire ﬂoor from which provides a panoramic view of the surrounding hills. On the fourth ﬂoor there was a small security group to keep the king safe. The fifth ﬂoor comprised of a large banquet room. The sixth ﬂoor was an interrogation room with incredibly low (four feet) ceilings. Lastly the seventh ﬂoor is the smallest and known as the “Burja” from the Arabic word which means tower. It was used as a lookout tower. This building used to be the army barracks. It is set behind a peaceful and still scenic garden area. Flanked by two small shrines to Vishnu. Although it’s hard to tell now but the building used to have four ﬂoors plus a slanted roof. Today it’s been reduced to only two ﬂoors. It will have to be completely rebuilt. Beside the damaged Garad Ghar is the old dance hall building known as Ranga Mahal. It was used to host formal events, ceremonial occasions and for performing arts. Today the building still stands with some damage though no entry is allowed. 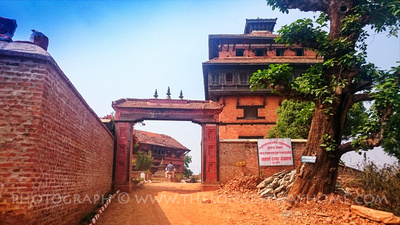 Though both Garad Ghar and Ranga Mahal may look like any other Newari building one must take into consideration they were built by a Shah king. There resemblance to Malla architecture is because the king used designers, artists and workers from Patan to construct these buildings. This temple was once a two-story Newar style building until the earthquake in 2015. At first the earthquake damaged the second roof but subsequently it needed to be taken down for safety reasons. 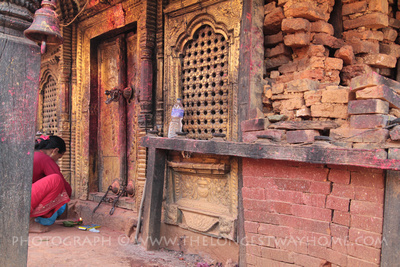 The Bhairab temple itself is said to be one of the oldest in Nepal though exact dating has never been confirmed. You can enter the temple complex from a series of stone steps that lead down. The inner courtyard is still in very good condition considering the overall damage to the temple. Of particular note is the impressive gilded entrance way. During the Sindur Jatra festival (March/April) a local priest drinks the blood of an entire buﬀalo and then vomits it back up. Some worshipers have been known to then drink this minute as a sign of devotion! Sometimes confused with being the actual fortress, this 35m block like temple is dedicated to the goddess Taleju. It was built in 1564 by King Mahendra Malla. The goddess Taleju was from south India but adopted by the Malla royals in the 14th century. Similar to the Kathmandu Taleju temple it cannot be entered even by Hindus aside from a single day during the Dashain festival. The temple itself took damage in the 2015 earthquake and took both internal and external damage. From the hillock you can get an impressive few over Nuwakot Durbar Square. 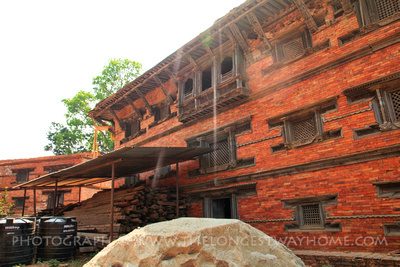 Here's more you can read about visiting Nuwakot. There are very few places to stay in Nuwakot though some "homestays" are planned in 2018/19. However, so are commercial homestays. The Famous Farm is perhaps the best known in the area but it doesn't come cheap with rooms around USD $100. You can check out the latest Famous Farm booking prices here through Agoda. Do be carefully if searching for places to stay in Nuwakot online as many hotels list themselves in Nuwakot but are actually many miles away. If you are looking for a homestay then you can contact me to see if they are open yet. There are none! The Famous Farm is about the only place you'll get "tourist" food. Even local places are hard to find. There is a local shop near the Nuwakot Durbar Square entrance selling snacks and drinks. Down by the main road will be some roadside eateries but take care due to hygiene. It's better to brink a packed lunch to Nuwakot if you are only visiting for the day. Buses leave from Gongu Bus Park in Kathmandu to Bidu or Trisuli Bazar taking around 4 hours. From Bidu it's easiest to hire a motorbike taxi to take you up the hill to Nuwakot otherwise it's a 1.5 hour walk! Do check in Bidu to find out when the return bus to Kathmandu is expected and time your visit to Nuwakot respectively. Taking the first bus from Kathmandu is advisable! Full transport details are in my Nepal guidebook below. This map of Nuwakot will show you where the most popular attractions are. For a more detailed map see my Nepal guidebook.